I’ve been seeing cookbooks by Yotam Ottolenghi in bookstores for quite some time and couldn’t imagine what someone with a name like that would cook. I finally decided to find out, so I went to Amazon and looked at a couple of his books. It is nice that you can look inside the books there and get a feel for one before you buy it. I learned that Ottolenghi was born in Israel and has lived in London. He and Sami Tamimi, who was born of Palestinian parents in the old city of Jerusalem met in London, discovered they had grown up very close to each other but hadn’t known each other. After becoming friends, they subsequently became chef co-owners of restaurants, c0-authors of cookbooks and entrepreneurs who make middle-eastern spices and foods available commercially. Ottolenghi also has a regular column and publishes recipes in The Guardian newspaper. His website is ottolenghi.co.uk. Lisa Mandelkern of Las Cruces was kind enough to give me a bag of pomegranates while we were at the Native Plant Society of New Mexico State Conference last weekend. I had a few ripened tomatoes ready to use from a fried green tomato cooking demo I did a couple of weeks ago. 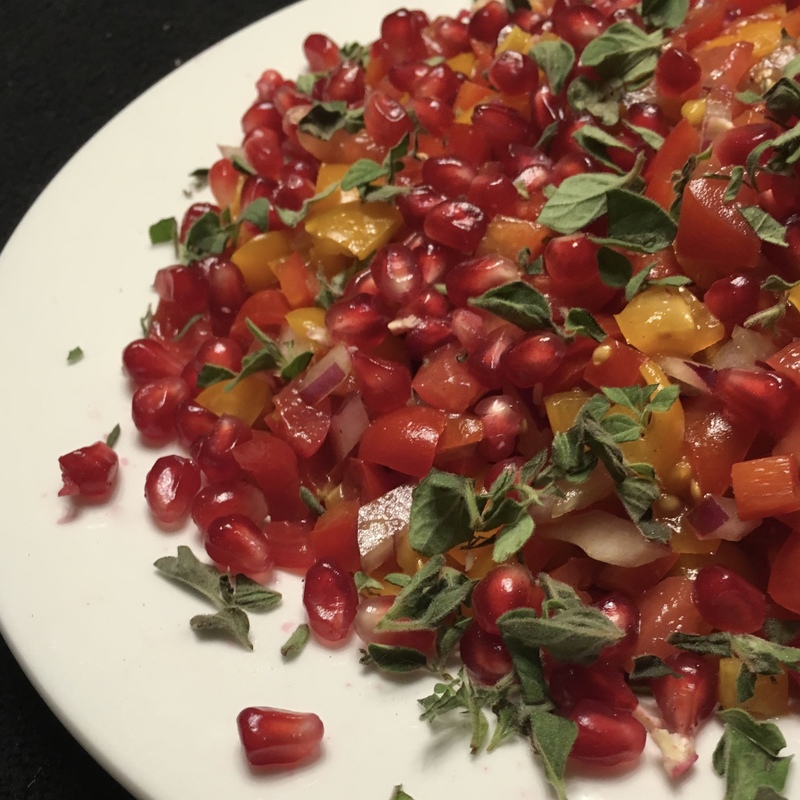 It was fate that I would discover a beautiful recipe for a tomato and pomegranate salad by Ottohenghi. I even had pomegranate molasses in my pantry from another culinary adventure! All I needed was a small red onion and a packet of fresh oregano and I was ready to go. How could I resist making Ottolenghi’s Tomato and Pomegranate Salad. With it’s wonderful pomegranate molasses based dressing, it is as delicious as it is beautiful with different varieties of tomatoes and the glow of pomegranate arils. Tomatoes are and pomegranates both are sweet, but in different ways. Pomegranate molasses has a delectable tartness that goes well with a hint of white wine vinegar. It is an amazing treat for the palate. I may have to have guests for dinner just to show this off! Here’s Ottolenghi’s recipe for this spectacular salad. It converted easily to make half a recipe that was the right size for two. Do yourself a favor and make it now at the end of the fresh tomato season and beginning of the pomegranate season overlap. My recent posts about Aleppo and Aleppo oil have nothing to do with Gary Johnson’s now famous statement, “What’s an Aleppo.” Rather, they are about a wonderful taste treat you might like. I’ve been using Aleppo oil I make myself. My daughter sprinkles crushed Aleppo peppers on salads. It is versatile and mighty good. 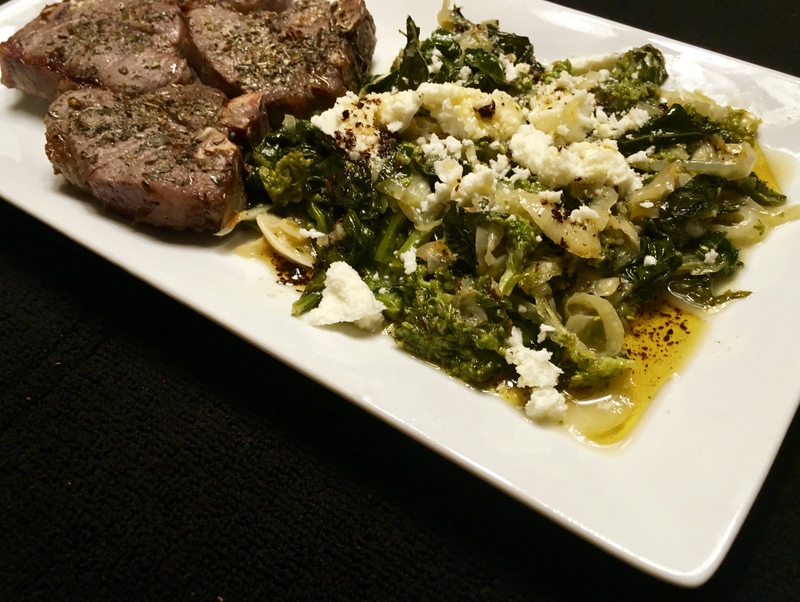 Braised Greens with Aleppo oil and feta and tiny lamb chops on the side. This recipe uses braising or what the author called “the cooked to hell” method of tenderizing fennel, Tuscan kale and broccoli rabe. It takes some prep work and simmering time, but is well worth the effort. The creator of this recipe called braising the vegetables the “cooked to hell” method, for making the greens meltingly tender. If you can’t find Aleppo, use 1½ tsp. crushed red pepper flakes instead. Aleppo pepper will me more mild than the red pepper flakes in my opinion. SERVINGS: 8 – the recipe is easily halved. Heat ¼ cup oil in a large heavy pot over medium. Add fennel and cook, stirring occasionally, until softened and browned around the edges, 5–8 minutes. Add onion, season with salt, and cook, stirring occasionally, until translucent and just beginning to brown, 5–8 minutes. Add garlic and cook, stirring, until softened, about 3 minutes. Add kale and broccoli rabe to the pot a handful at a time, tossing to wilt after each addition before adding more. Stir in red pepper flakes; season with salt. Add 3 cups water and bring to a gentle simmer. Reduce heat and cook, partially covered, until greens are very tender, 35–45 minutes. While greens simmer, make Aleppo oil. Bring Aleppo pepper, paprika, and remaining ¼ cup oil to a simmer in a small saucepan over low heat, swirling often, about 1 minute, let cool. Add lemon zest and lemon juice to greens; taste and season with more salt.Transfer to a serving platter along with some of the braising liquid and top with feta. Drizzle with Aleppo oil. Coat lamb chops with lemon juice, sprinkle lightly with kosher salt and pepper. Pat dried oregano leaves onto chops’ surface so they will stick to the lemon juice. Bake at 400º for two to three minutes a side until an internal temp of 145º is reached for medium rare or 160º for medium. Tent and rest for five minutes before serving. I journeyed to Jerusalem for Aleppo pepper! I’ve very excited that we will have a Whole Foods Market in El Paso opening in about six weeks. I expect to have access to a broader variety of vegetables and condiments than we are used to finding here. I’m very glad that Mark Heins, formerly owner of the Greenery Restaurant is changing careers to become the manager of the Whole Foods store. His years at the Greenery and its wine shop and bakery next door make me certain that the Whole Foods people made a good choice. I prowl El Paso’s little neighborhood stores for treasures like oil cured olives, sumac (not the poison kind) and epazote for my culinary adventures. In Jerusalem, a Middle Eastern restaurant and attached grocery, I found Aleppo pepper. I’d read recipes with it and finally scored a 1 lb. bag for a very reasonable price – about half the price of a one ounce can I saw at Williams Sonoma. 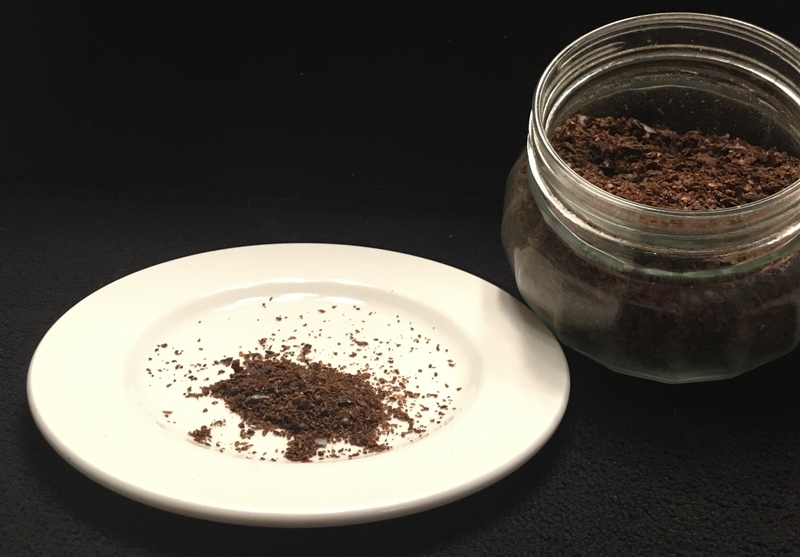 Aleppo pepper is named after Aleppo, a long inhabited city on the Silk Road in norther Syria. It is grown in Syria and Turkey. It starts as pods that ripped to a burgundy color, then are semi-dried, seeded and crushed or ground. It has a moderate heat of around 10,000 on the Scoville scale. Its scent is a little fruity and mildly cumin-like. It reminds me of ancho chile powder, but is a little more mild and oily. It is delicious. A spoonful of Aleppo pepper. note the rich color and coarseness of the pepper flakes. My jar barely holds a pound of the pepper. I’ve been assigned to make a potato dish for a potluck on Saturday night. I decided to experiment with tiny new potatoes and thought of my stash of Aleppo pepper. I sautéed potato coins in a little olive oil until they were crisp on the outside and tender on the inside. After plating them, I drizzled them with Aleppo oil and a light sprinkle of kosher salt. I modestly have to say they were terrific. I expect the Aleppo oil will probably be a new experience for my friends on Saturday night. I also, drizzled a bit of oil on my steak, but decided that it was too subtle for the red meat. I’ll be report on work with the oil and other vegetables soon. Simple and savory. Sautéed potato coins drizzled with Aleppo oil. 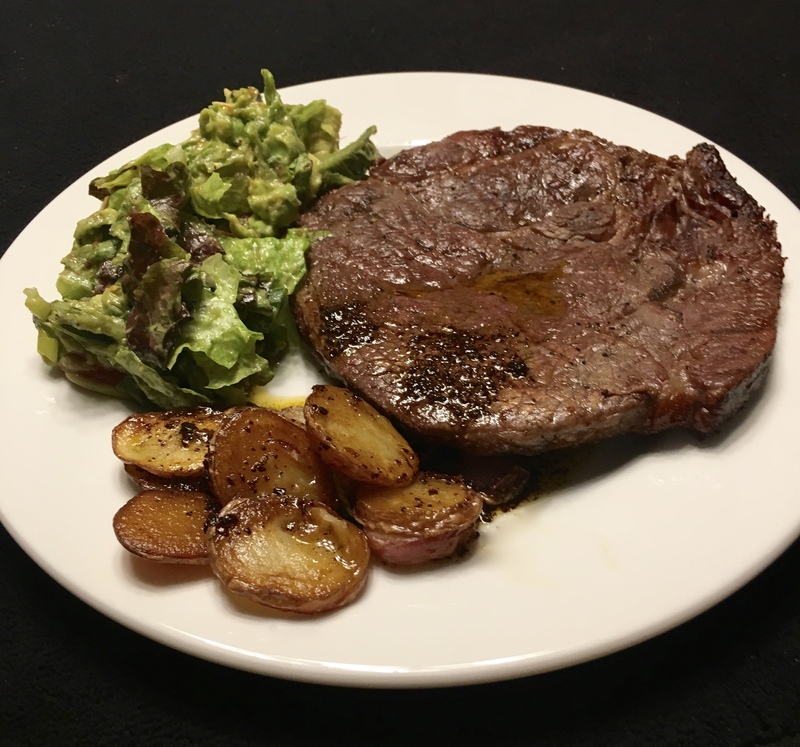 a grilled steak and green salad. Note the Aleppo oil and pepper on the tip of the steak. In a small pan, simmer Aleppo pepper and paprika in oil for about a minute to infuse their flavors into the oil. Swirl you pan frequently while simmering. Let cool and drizzle over vegetables. You’ve held up well to many versions of greens and beans, a favorite quick and easy dinner fix for me. Here’s another way to do it – without a recipe! I simmered three beef sausages covered with water for about 15 minutes, per package instructions. I set them aside, dried the pan and sweated some chopped onion until translucent. I stared out cooking the onion in scant splash of olive oil and as it began to soften, I added a healthy splash of chicken broth. As it finished cooking the onion, the broth developed a little more flavor. When the onion was ready, I added a chopped kale and chard mix and some garlic chips with more broth and simmered it all until the greens were tender. I like the chips of steamed onions as a surprise bite in the greens. Then, I stirred in a can of rinsed cannellini beans and a healthy couple of splashes of white wine vinegar. 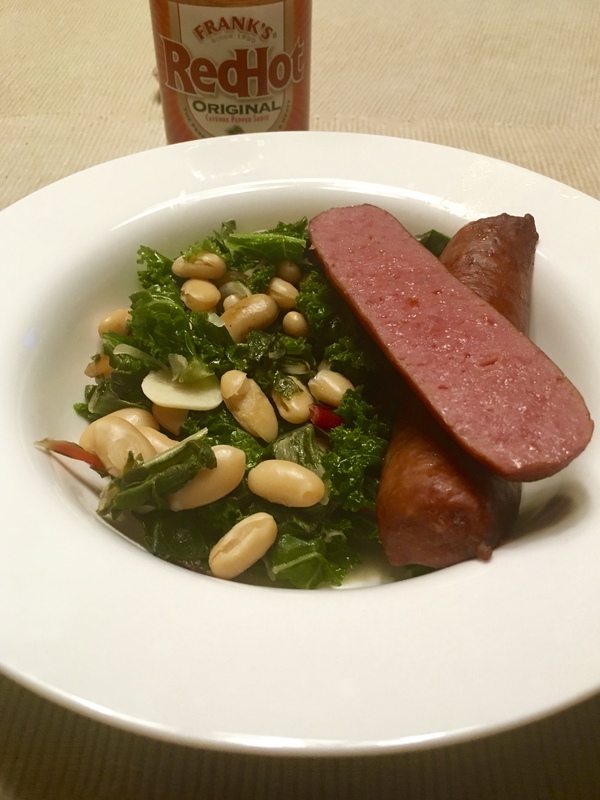 I stirred it up until the beans were warm and plated it in a bowl with the sausages – one and a half sausages peer serving was enough to counteract the health benefits of beans and greens. Sometimes I serve beans and greens with lots of broth as a soup and the addition of a little pasta. At other times it is thicker as a sauce for linguine. And sometimes it is served with almost all the liquid cooked off as a side dish. I primarily use cannellini beans, but I’ve been known to use pinto beans and red pepper flakes for a southwestern touch. Good flavor combos are very flexible. Kale and chard greens and beans with sausage was just right for a cloudy evening with a slight hint of fall in the air. I do have to have a splash of hot sauce on my greens for a little extra kick. While the beans and greens and sausage were prepared without a recipe, I must confess that there is an out of the picture side made with a recipe. Southern corn bread for sopping up the bean juice! I use the recipe on the Quaker Corn Meal container, but I eliminate the sugar it calls for. This is corn bread, not cake! For this meal, I followed the recipe. At other times, I add green chile salsa or corn kernels or chopped crisp bacon just for the fun of it. I’ve mentioned the Bon Appétit online “Cooking Without a Recipe” feature a few times. I have borrowed that title as part of new category on this blog: “Play With Your Food – Cooking Without a Recipe.” I’m enjoying experimenting with everyday staples in new ways and writing about the experience. You probably have realized that I love chiles rellenos (stuffed long green chiles). They are a lot of work and can make quite a mess if you fry them. My mother made crispy crusted chile rellenos rather than the traditional soggy egg battered version. I’ve replaced her crushed cracker crumbs with panko to make a crusted baked relleno and a stuffed green chile in a pan-browned corn tortillas that I call chiles rellenos al flojero – lazy guy chiles rellenos. Panko crusted baked chiles rellenos. Chiles rellenos al flojero – lazy guy chiles rellenos. Now, I’ve done a riff on that and combined my rellenos flojeros with the fixings for huevos rancheros another breakfast favorite, ranch style eggs and chile. You warm corn tortillas, cover them with a green chile sauce of chile, tomatoes, onion and garlic and top them with soft fried eggs. There’s something magical about silky soft egg yolk and chile sauces. 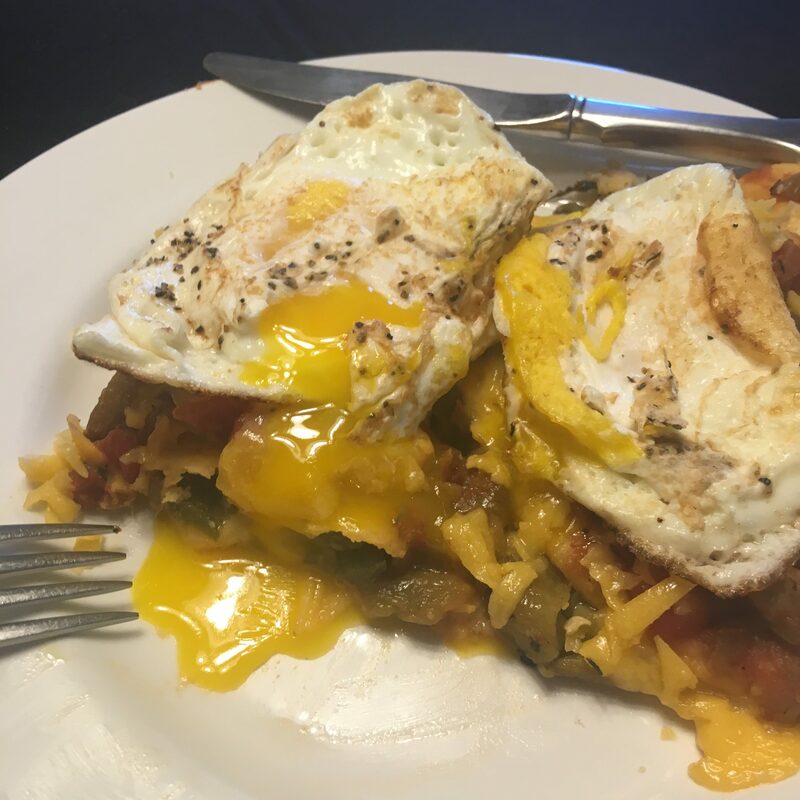 If you use green chile sauce on one, and red sauce in the other, it is called huevos divorciado – divorced eggs. Huevos divorciados – one chile and egg topped tortilla with green sauce, the other with red chile sauce. Playing with my food, I made chiles rellenos al flojero, then drenched them with green chile sauce and topped them with a soft fried egg as I would for huevos rancheros. I’ll have to call this riff huevos rancheros rellenos because the tortillas are filled with stuffed chiles and folded. What ever I call it, it was a terrific breakfast made without a recipe a by playing with my food. Huevos rancheros rellenos – best of both worlds – stuffed green chiles and green chile sauce drenched tortillas toped with eggs. Would this breakfast two days in a row be a bad thing? Meanwhile, Back at the Doublewide… in Manhattan? The Bon Appétit website has a feature called Cooking Without a Recipe that I enjoy very much. I’ve even purloined the idea with a blog category I call Play With Your Food – Cooking Without a Recipe. BA Test Kitchen Manager Brad Leone recently shared a quick supper treat I really enjoyed. I’ve copied his description of making this hearty meal below and put his words in quotes. 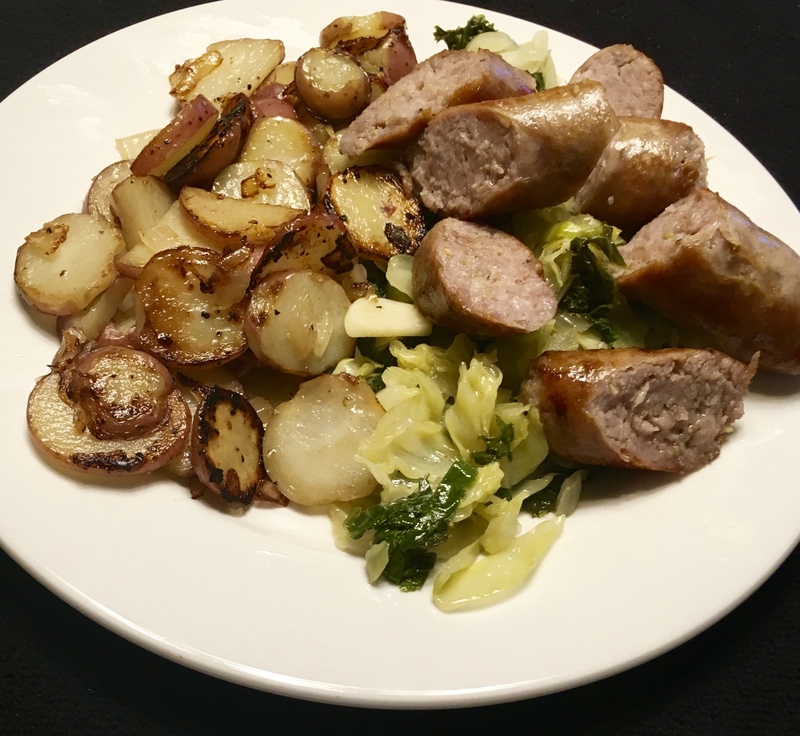 His greens and sausage seems more like a Dinner at the Doublewide than a New York City meal! ‘Taters, sausage and greens. You’d think it was supper at the doublewide instead of a food magazine idea. “Preheat the oven to 350°. Remove the stems from one bunch of Tuscan kale and tear the leaves into 1″ pieces (mustard greens, collards, spinach, and chard are great, too). “Coarsely chop half a head of green cabbage. Combine the greens in a large baking dish and add 4 cloves of thinly sliced garlic. Adding some sliced onions and shiitake mushrooms at this point is optional, but highly recommended (I’ll sauté the onions and mushrooms in a cast iron baking dish right on the stove before adding to the greens). “Coat the greens with some olive oil and pour ½ cup chicken stock or broth over everything. Cover the dish with foil and bake until the greens are wilted, about 15 minutes. Remove foil and season with salt and pepper. Continue to bake until cabbage is tender, about 20-25 minutes more. Combining bitter greens and cabbage was a g00d idea for flavor and texture. The addition of a shot of vinegar balanced the greens. Since there was no “recipe” I had to add my own touch to the meal. Taking advantage of the scant pan drippings from the sweet Italian sausage to sautéd some chopped onion and new potato coins to serve as a side for the sausage and greens. Per Mr. Leone, I used mustard greens and sherry vinegar. At the table, I splashed some Frank’s Red Hot Sauce on the greens for a little extra kick. We always had hot sauce on our greens growing ups so it seemed the right thing to do.